It’s no secret that I’m attracted to fantasy and magic. So much so that I will pick up any title with a promise of witchy wonder. I would even ignore my own partner’s review of the same book – ok, I didn’t read it, but that’s only because I couldn’t take my eyes off the title – to give my imagination some exercise. I devoured the first quarter of the book with such hunger I actually forgot to sleep. I sat up at night making notes about how interesting it is that a contemporary book merges magic, science and academia. 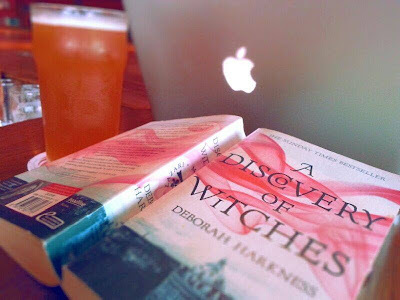 I absolutely loved the descriptions of alchemy in the research of our protagonist, a highly decorated historian and non-practicing witch, Diana Bishop. I also didn’t mind Mathew Clairmont, a seriously accomplished scientist and vampire whose current passion -- he’s had many over his lifespan of 1500 years -- is genetics and mutation. Set in the academic city of Oxford, England the writing is powerful enough to exude the smell of old parchment, rare books and ancient libraries. Our story begins instantly as Diana starts to hear whispers when she calls up Ashmole 782, a manuscript she wants to refer to for a research paper in alchemy. She opens it to discover that it’s actually a palimpsest, a book from which its old text has been washed away, or hidden in this case by magic and covered with new text. All she needs to do is touch its pages and it will reveal to her its secrets. But as one who has turned her back on witchcraft, she tells herself that she isn’t interested. Also, as a historian, it would be sacrilege to touch so old a scroll lest its pages crumble. She sends the book back without further delay but soon realises that it is an elusive scripture bearing the secrets of how and why vampires, witches and daemons exist. The sudden arrival of hoards of creatures in Oxford within close proximity to her serves as an indication that the book is very much sought after. But, as these things go, it is only Diana who can summon the book because turns out it was bewitched centuries ago to stay hidden, and as one who doesn’t (know how to) practice magic, she is clueless as to how she's meant to break the spell. Enter our vampire love interest Mathew who initially wants the book for his own research on genetics and mutation – specifically, those of the first vampires – and finds himself falling in love with her. In typical vampire style, he takes it upon himself to protect her from other creatures, including fellow witches who are out for blood. She resists, but the frequency at which she is threatened soon convinces her to take his help and eventually fall head over heels in love with him. The book has the ‘X’ factor which made The Da Vinci Code such a raging success. It has the elements of magic – in an adult capacity of course-- that turned Harry Potter into one of the most beloved fantasy series’ of our generation. It also has poetry in its use of words and back stories that makes certain moments so much more powerful. But most importantly it has magic in its writing as it paints vivid scenes of dark holes with shimmery ghosts and smoke creatures crawling out of bowls. Where it fails is in its similarities to Twilight and The Vampire Diaries -- not in its adaptation (or lack thereof) of vampire lore but in the nature of the vampire's relationship with the mortal. Harkness spends too much time trying to paint a stupid love story that really could have done with fewer words. At the highest point of its mystery and intrigue, Diana receives a photo of her parents mangled bodies from the time when they were murdered years ago. Next thing we know, she’s been whisked off to Mathew’s castle in Sept Tours, France where they spend what seems like a large portion of the book discovering everything it would seem, except witches. “No thank you,” I snapped. "I’d much rather take a stake to the heart." But seriously, if you dream of the day you will finally find the perfect man to bite your neck, buy A Discovery of Witches from Flipkart here.